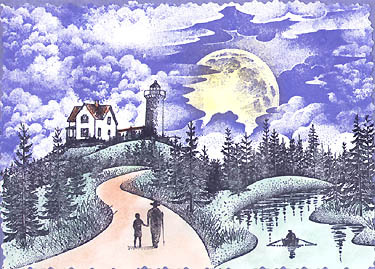 Images: Lighthouse by Haveman Stampin, Country Stream by A Stamp In the Hand. Crooked Path 146F, Buck 008A, Row Boat166A, Back Packers lg. O03B and Luminous Sun 199E by Stampscapes®. Media: Card stock blueberry and face card is white velvet by Ashton Papier. Done with soft pastels and sealed with a fixactive. Note: Located in Door Country, WI the 86 foot tall lighthouse overlooks Lake Michigan between Baileys Harbor and North Bay. The light is observable for 17 miles. Images: Lighthouse By Hardware Stampin. Crooked Path 146F, Geese In Flight 039A, Backpackers Lg 003B, Lakeside Reflection Lg 051G, Luminous Sun 018E by Stampscapes®. Face card white velvet and card stock is blueberry from Ashton Papier. Art done with prisma colored pencils and soft pastels and sealed with fixative. Note: Built in 1857 located on big charity island at entrance to inner Saginaw bay. The island was named by early fisherman who believe it was placed there by gods charity as a refuge from storms. The light was discontinued in 1939. 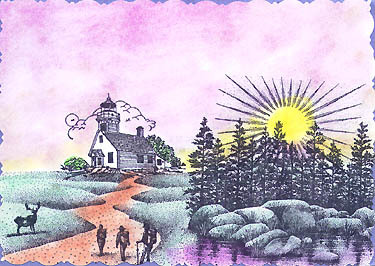 Images: Lighthouse from Hardware Stampin. 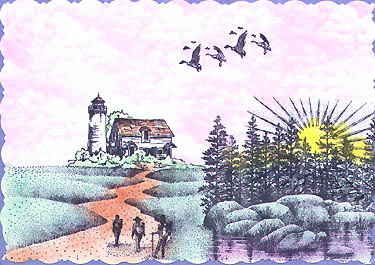 Crooked Path 146F,Buck 008A, Backpackers Lg 003B, Luminous Sun 199E by Stampscapes®. Note: Mission Point Lighthouse in Grand Traverse Bay, MI. Built 1870 located on the tip of the old mission in grand traverse bay. It stands on 45th parallel, half way between the equator and north pole. The original building has survived, but the light has not. Face card is white velvet and card stock is blueberry by Ashton Papier. Done in prisma colored pencils and soft pastels and sealed with a fixactive. Images: Lighthouse by Repeat Impressions. 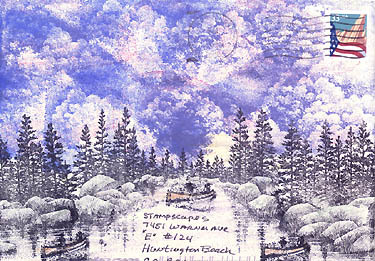 Country Road & Country Stream by A Stamp In Hand Co. Row Boat 166A, Hiker & Child165A, Cloud Cumulus 018E, Clouds & Rising Moon Lg 198G by Stampscapes®. Located York, Maine built in 1879. Known as Nubbler Light. This lighthouse was built on an island, just off shore. A red light flashes every 6 seconds. Art work: clouds done with memories mid-night blue dye ink pad. Rest of card done in Prisma colored pencils and soft pastels. Sealed with a fixactive (scene becomes darker & sharper). Card stock from Ashton Papier. Michigan. Built in 1871, located at entrance to St. Marys river and the Soo Locks near Brimley on Lake Superior. Name came from the massacre of invading Iroquois warriors by the Ojibwa Indians in 1662. 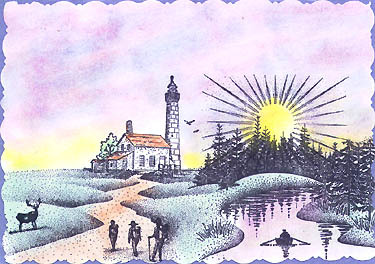 Card Images: Country Road & Country Stream by A Stamp In The Hand Co. Lighthouse By Stampin Hardware. Hiker And Child 165-A, Cloud And Rising Moon Lg 198G, Cloud(Cumulus) 018E by Stampscapes®. 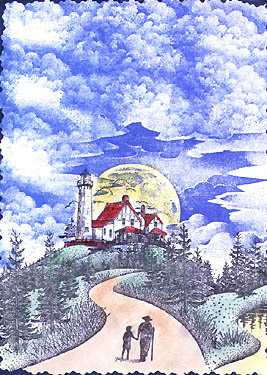 Artwork- sky with Memories midnight blue ink, Prisma colored pencils on lighthouse roof and soft pastels on rest. Sealed with a fixactive for darker, softer effect. Card stock by Ashton Papier. Envelope Images: Lakeside Cove Lg. 049G, Lakeside Reflection Lg. 051G, Canoe 010A, Tonal Ap. (Rays) 117E, Clouds(Cumulus)018E by Stampscapes®. Artwork- sky with Memories midnight blue and crimson ink. The rest done in Prisma colored pencils.